I enter this card into a challenge over on the Moxie Fab World Blog. For the love of hydrangea, a photo by Zayasa on Flickr. I heat embossed the Hydrangea, colored it with Wild Honey distress ink pad and embellished with tiny pearls. The bright yellow ribbon was died with the same ink to match the colors perfectly. I overstamped the main panel with Old Letter Writing and heat embossed the card base with the Circle Doily. I am playing with different colors and sentiments. I think it could be a good card both for a wedding and a birthday. These're the Hero Arts stamps I used for the card. I also entere the card into the Simon Says Stamp and Show challenge: Anything Goes. 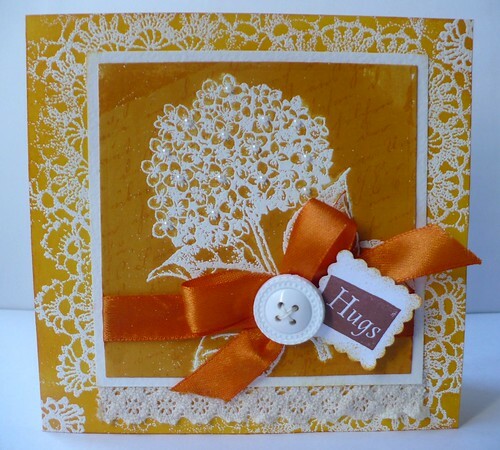 Beautiful cards Maria and love the wild honey colored one, that Hydrangea looks great in the white embossing! This is so delicate and pretty. It looks wonderful no matter what color you used. Thanks for joining the challenge at Simon Says Stamp & Show.